This is the Bi-Polar Girl story. It describes the slow destructive climb followed by the long downhill road that eventually brought me to the massive breakdown I experienced at the beginning of 2005. OR the reader is able to read and process text, so the story is also told in short sentences written in straightforward language. Writing such a HUGE experience in such short text format was tentamount to "capturing the ocean in a thimble" as my son put it. OR the reader is well enough to engage in self-reflection so the story also asks carefully constructed questions that enable the Bi-Polar Girl story to become the reader's story. As the introduction to the book says, this little book was born from a desire to bring a smile in the waiting rooms of psychiatric clinics and hospitals. 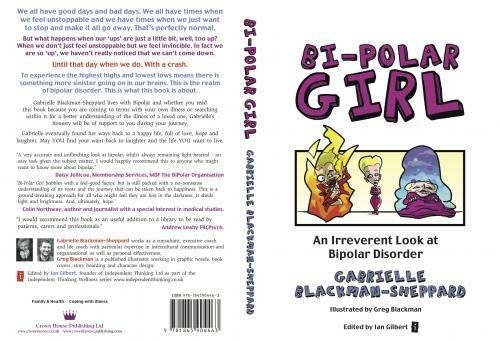 The book does not contain any information about Bi-Polar Disorder as such because there are plenty of places where that information is available (see Resources). The only thing I felt I could contribute to the understanding of Bi-Polar Disorder was my own personal experience with my own individual version of the illness. May you indeed find your way back to laughter.